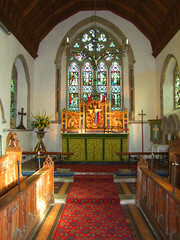 I love Victorian churches, and I had long been looking forward to coming back to All Saints. When I was last here in 2006 the church was locked without any keyholders listed, but I'd been told there'd been a turnaround in thinking here, and the church was now accessible. Of course, this church isn't really Victorian. 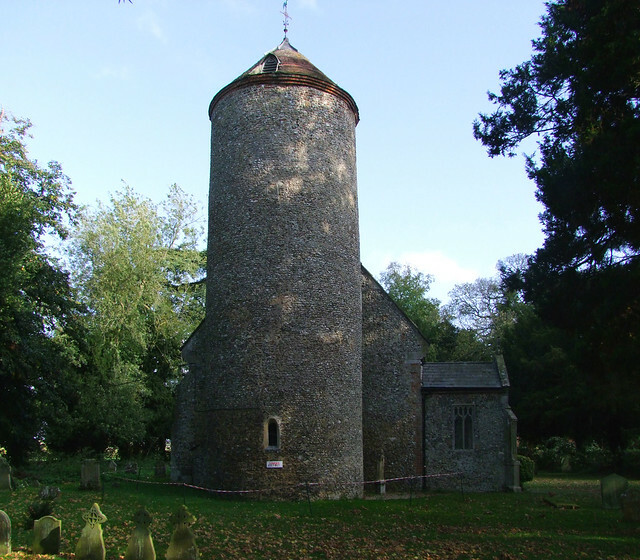 It is one of the many medieval round-towered churches in the Wensum valley to the west of Norwich. 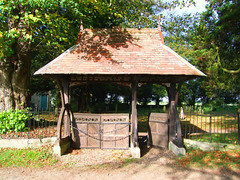 But it was totalled in the 1870s at the expense of the Rector, John Barham Johnson. 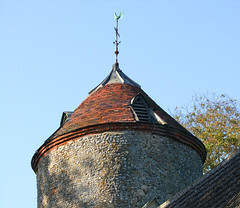 He replaced the chancel, completely refitted the shell of the nave, and finished off the round tower with a brick course and conical top. 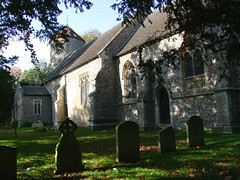 The tower is curiously short on openings, making an age difficult to guess, but Detective Pevsner noted the thickness of the nave west wall, suggesting that the church was here before the tower, as is common in this part of Norfolk. This would place the tower no earlier than the late Norman period. I looked forward to testing this theory for myself. Everyone speaks highly of Welborne. Even dear old Munro Cautley, who ordinarily had any Victorian architect who strayed onto his land dragged behind the stable block and shot. He describes it as beautifully restored. The funny thing is, it isn't clear who the architect here actually was. Could it have been Barham Johnson himself? My desire to investigate the tower fell at the first hurdle - it was cordoned off by a safety fence with a Danger - Keep Out sign. It seems that the work of the 1870s is coming to the end of its natural life, and tiles and the like have started falling onto the heads of anyone unfortunate enough to walk below. The tiny parish has set in motion an ambitious plan to raise over a hundred thousand pounds needed for the repairs, and jolly good luck to them. Well, the church still wasn't open, but there was now a notice with four telephone numbers you could ring for the key. I rang one. 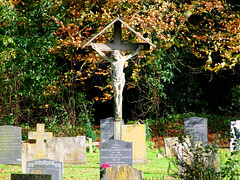 The man who answered seemed a little unclear as to why I was ringing (I think I may have woken him up) but eventually we negotiated that he'd come down and open the church for us. And he did. He nipped in to turn off the alarm, and we stepped into an utterly beautiful space, a tiny yet full blown Anglo-catholic interior of an age of confidence. 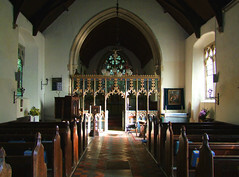 My eyes were drawn to the beautiful roodscreen in the style of the 15th Century, and as if by magic the chancel came alive beyond as the keyholder switched on the lights. 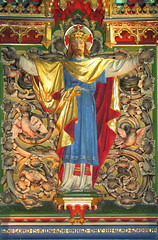 Now, it was the gorgeous reredos, Christ in Majesty flanked by the Lamb of God and a Pelican in her Piety, which dominated the church. At one time the liturgy here must have been the Highest of the High, and although that is clearly no longer the case the beauty of it survives. 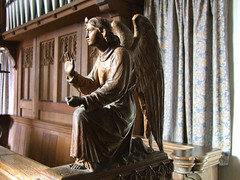 The furnishings are exquisitely carved, those on the chancel stalls dominated by, firstly, St Michael on the north side banishing Adam and Eve from Paradise, who stand somewhat bewildered on the south side. 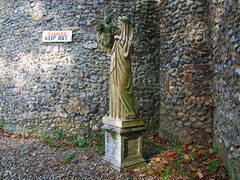 And then, further east, St Gabriel kneels in supplication to the north while the young Virgin Mary stands at her prayer desk to the south. It all must have cost an absolute fortune - Barham Johnson must have been a very wealthy man. 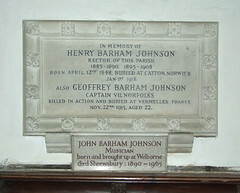 At the north-west corner of the nave is a memorial to Henry Barham-Johnson, son of the restoring Barham Johnson. 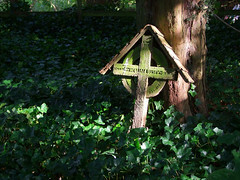 Henry followed his father as Rector here. 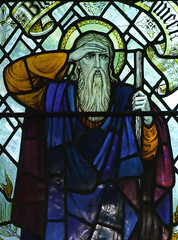 One of Henry's own sons, Geoffrey, was killed in the First World War. Another son, John, was a popular composer of piano and church music. Both are remembered on the memorial with him. 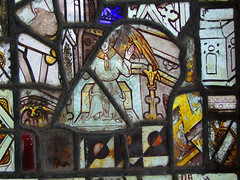 Out in the porch window there is a curious survival, a smattering of medieval stained glass fragments. 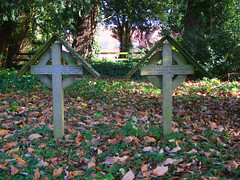 They came from the same collection as the great sequence of Saints and Martyrdoms in the church at North Tuddenham. They were found in a builder's yard in Dereham in the 1880s, and were bought for fifty shillings. 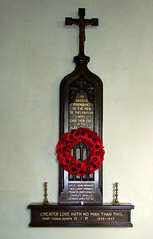 The bulk was installed at North Tuddenham, but the Rector gave the odd bits left over to Welborne. 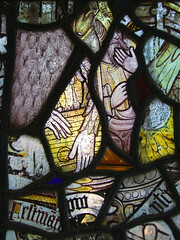 Some of the fragments of inscription here match bits of inscription in the other church, and are part of a massive sequence of the life and martyrdom of St Margaret. No one knows where it all came from originally. It must have been a big church. And at last we stepped outside, blinking in the low sunshine. 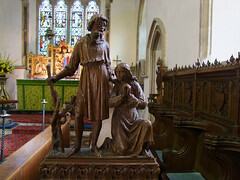 A statue of the Blessed Virgin and child stands to the west of the porch, a relic of Anglo-catholic days, and the pleasing little churchyard is completed by one of Norfolk's best lychgates in the Arts and Crafts style. It was all very satisfying. The keyholder gave us a cheery wave, and we set off for Mattishall.